"After turning 50, my doctor told me that I had to exercise to reduce my stress level." Mary Cisiewski grew up as a competitive swimmer, staying in shape by spending most of her childhood and adolescence in the pool. But college was another story. Mary headed down to New Orleans, where food and drink were plentiful. She soon found herself gaining the “freshman 15,” which started a love/hate relationship with diet and exercise that she maintained throughout her adult years. After turning 50, though, her attitude changed. “My doctor told me that I had to exercise to reduce my stress level,” Mary says. She also observed how a lack of exercise impacted her aging mother’s mobility, and she did not want the same experience for her own golden years. Mary has belonged to other “big box” gyms in the past but found that she struggled to really commit. “I’ll find 100 excuses not to go,” she says. 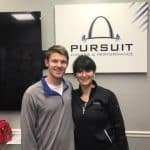 Scrolling through social media one day, Mary stumbled upon an ad for Pursuit Fitness and Performance (PFP). She liked that the gym’s sign up system came with built-in accountability. She felt that signing up for a specific class might force her to keep her commitment. Least favorite exercise: Hip hinges or squats. But I do like that I can do both of these now with weights! When I first started, I couldn’t even do them without weights. Go to healthy meal: I like to throw together lettuce, berries, feta and then some salmon tossed in the oven with lemon and pepper. Hobbies: Attending Blues and Cardinals games and country music concerts. Favorite is Kenny Chesney, and I’ll be attending the CMA Music Festival in Nashville this year!